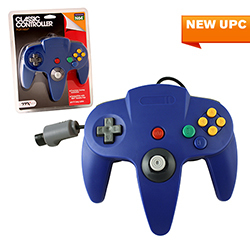 Blast to the past with this classic controller for the N64??? game system! Modeled after Nintendo??? 's original design, the controller features 10 active buttons (including left and right shoulder functions, and Z-trigger). The famed joystick will allow you to relive that classic gaming feel while the D-Pad commands your action with precision! The controller's data port is compatible with N64??? Rumble or Memory Paks, and a long, 6-foot cord ensures that you're comfortable while you enjoy classic games like Mario Kart?? ?64 and Golden Eye??? 007?? ?.